This post by David Culberhouse (Educator, Senior Director Elementary Ed, Previous Principal CA Distinguished School, Co-Moderator West Coast #satchat) is the fourth in a series called “The Creative Leader”. 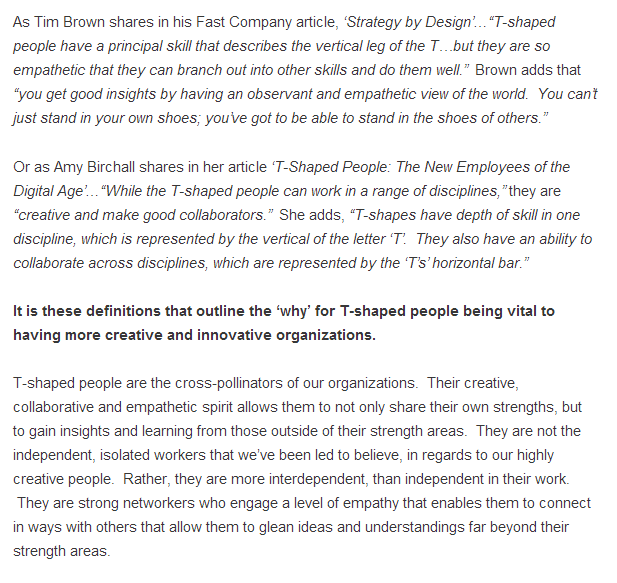 Here he explores the notion of ‘T-shaped’ people. His message is clear: leaders need to understand what creativity and innovation look like, and they need to intentionally build a staff with people who have depth of knowledge in one area and who can also branch out and work creatively and collaboratively in another. The work of leadership is not just to ensure that educators have deep knowledge of their disciplines, but that they have the flexibility to move laterally across the building, across disciplines, across grades to be innovative and creative. 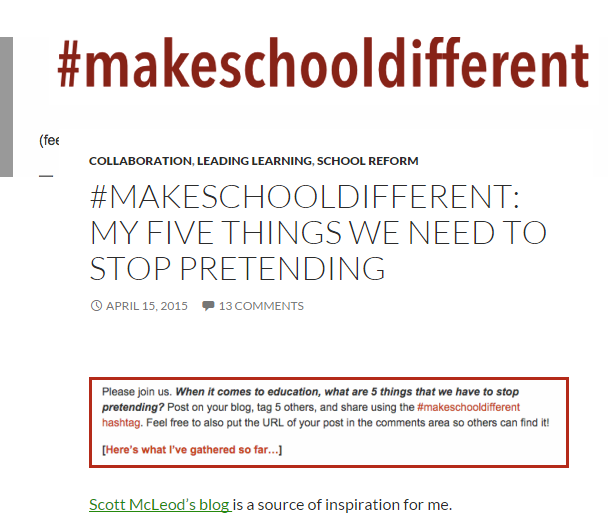 I love this post because I do think that we need to figure out how to become more interdisciplinary in high schools. We need to not just have ‘open doors’, but flattened walls. We need people who can think and create and innovate and initiate from their deep curricular and disciplinary knowledge and who can also take that thinking, creating, innovating beyond their curriculum and discipline to uncharted waters.